"This dish is a family favorite. 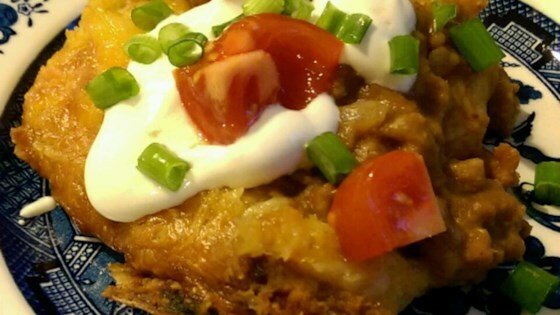 It is best served with salsa and sour cream. It is also wonderful reheated in the microwave as leftovers." In large skillet over medium heat, cook beef until browned. Drain. Combine with taco seasoning and refried beans. Spread half of mixture in 9x13 inch baking dish. Top with two tortillas, trimming if necessary, and half of cheese. Repeat layers. Bake 35 to 45 minutes until heated through and cheese is bubbly. Top with green onions and tomatoes. Let cool 5 minutes before serving.